Does your jaw click and pop? Do you frequently have sore facial muscles? If so, you may require TMJ treatment in order to relieve your symptoms. TMJ treatment, or temporomandibular joint dysfunction treatment, refers to treating various symptoms of the jaw. TMJ disorders can cause serious problems with your health and wellness. Sometimes TMJ problems are so severe, they prevent you from eating and chewing properly. Your jaw joints, muscles, and tendons have a complex relationship. Clenching and grinding your teeth can contribute to problems with your TMJ. Accidents and trauma also are commonly contributing factors to TMJD. While no cure exists for TMJ disorders, treatment can reduce pain and increase your quality of life. In most cases, treatment is non-invasive and therapeutic. In order to accurately diagnose TMJ disorders, your dentist will perform a thorough exam of your jaw and surrounding muscles. Looking at your range of motion, how your teeth come together, and listening to your joints can all provide valuable information regarding the health of your jaws. We may also recommend diagnostic imaging in order to provide accurate diagnosis. 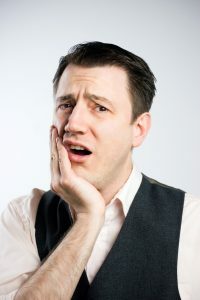 An occlusal guard (splint) can help reduce the symptoms of TMJ in a couple of ways. By providing a barrier between your upper and lower teeth, some of the force from clenching and grinding is absorbed. Additionally, we design occlusal guards that help your jaw remain in a comfortable position while you sleep, reducing some of the symptoms of TMJ, including headaches and facial pain. Occlusal guards also protect your teeth. When you clench and grind your teeth, you are more likely to crack a tooth, causing pain and requiring dental crowns. Years of tooth grinding (bruxism) can wear your teeth down, destroying your enamel, and exposing the soft dentin in your teeth. With dentin exposed, you are more prone to tooth decay and sensitivity. Treatments such as medication and behavior modification can contribute to the success of your TMJ treatment. Often, it is necessary to employ several different methods to address problems with your jaw. Massage, stress management, medication, and relaxation techniques are some of the most common complementary methods. TMJ disorders often stem from a traumatic event such as an automobile accident where your jaw received direct trauma from impact or indirect trauma due to whiplash. We can treat patients with TMJD due to a motor vehicle accident and help restore comfort, health, and function. Call our Edmonton dental office to schedule a TMJ evaluation with Dr. Jim Haymour, Dr. Everett Postill, or Dr. George Laschuk. At Kingsway Dental Centre, we have 25 years of experience we can apply to support your oral health.